If fabric and quilts from the 1800s make you happy, then be prepared to be elated with this gem of a book from Paula Barnes and Mary Ellen Robinson of Red Crinoline Quilts! These ladies have put together a gorgeous collection of their favorite bed sized quilts. But lovely quilts and careful instructions aren't all you'll find. The photographs show off the quilts in authentic 1800's settings and each quilt is accompanied with an interesting story of the Civil War era that ties in with the quilt. 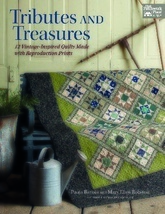 Tributes and Treasures is one of the rare project books you'll love to read! You'll also love the 12 projects in beautiful ï¿½ and unexpected ï¿½ colors, all authentic to the time. Flashes of oranges and even pinks brighten the blues and browns.